If you are looking for information on the Images 4 Kids franchise business opportunity, Images For Kids franchises or Images 4 Kids franchising, then you have come to the right place. Isn't it time you start living your dream? Do you love photography and enjoy working with children? Have you always dreamed of owning your own business, but just didn't know how or where to start. Well, Images 4 Kids just might be the career you've always dreamed of. 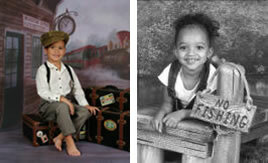 We specialize in providing day cares, preschools and private schools with high end, studio quality portraits. There is a certain magic working with children and capturing perfect images that will become treasured memories. You will be leaving corporate America far behind and entering a world filled with hugs, kisses and laughter, and for this, you get paid! Just imagine, long summer vacations, no more working nights, weekends or holidays. You'll now have time for the important things in your life ... your children, your family, your friends and yourself! The digital revolution in photography has opened up a wonderful new opportunity for anyone who has a passion for photography to finally achieve your dreams of owning your own company and having a job you truly love, while also making a very good income. And one of the best things about Images 4 Kids ... It's a home based business, so you will not have high fixed costs or be forced to work long hours! Our goal is to keep our start up costs low so you can recoup your initial investment and start make a profit sooner! What sets Images 4 Kids apart from the other photographers? The world of photography has changed in many ways. So many people now have great digital cameras leaving many areas of professional photography no longer as profitable as they were in the past. Free standing studios are beginning to fade as people improve at amateur photography. Many areas seem to be seeing a decline, such as wedding photography, family portraits and special events, as more people are saving money by using friends and family members who know a bit about photography. The founder of our company has been in the business for over 24 years. Throughout this time she owned 2 separate studios and did virtually every kind of photography under the sun. However, she found that while trying to go in so many different directions, she wasn't able to build a solid core business. It was like the old saying ... Jack of all trades, but master of none. The one solid fact she discovered was this: Ask any parent if they can get a good professional looking picture of their own child and the answer is a resounding "NO". She left all the other photography behind and structured her entire company on being the very best in the children's photography field and succeeded beautifully, as are many of our franchisees across the nation. Images 4 Kids is a very established franchise company with over 70 franchisees in 26 states, coast to coast. Our franchise is based on a solid and proven business model, unlike some that are based only on a concept. We've already made all the mistakes in the past, so that you don't have to! By franchising, we are able to offer so many people a lifestyle they couldn't have dreamed possible. It's an extremely lucrative field and you will never run out of customers, new ones are being born everyday! We offer the very latest in technology and our proprietary e-commerce system represents the very best in online photography ordering systems. Our online system allows parents to view and order their child's pictures online and they can share them with friends and relatives across the world! We are continually committed to ongoing development of new opportunities to maximize your profit potential and always keep you ahead of the rest. What does all of this mean to you? More sales, more profits and a competitive point of difference! When you leave training, we promise that you'll be 100% trained and ready to return home and start things in motion. But when joining our franchise, it's more like becoming a member of our family. We realize that our success depends on your success. Our number one priority in everything we do is to maximize your earning potential. You are in business for yourself, but not by yourself. We will always be here to help you in any way possible. Unlike most companies, we do not charge ongoing monthly royalty fees. We are achieving our dreams of putting a new face on franchising! It's a team effort and we have the greatest group of franchisees anywhere! Next, we encourage you to fill out an application for more information. We'll then send you more information to help you decide if being a part of the Images 4 Kids family is right for you. Isn't it time to start acting on setting your goals of personal and financial independence? If you are ready to step out of Corporate America and pursue your own dreams, now is the time! Territories are limited and selling out fast, so don't delay!